Cactus Flower Florists: Crazy Deals on Roses this Month! Crazy Deals on Roses this Month! While we might sell the most roses in February, June is by far the best month to buy and give roses. We're offering a new twist on a dozen roses that will last well beyond the flowers themselves. 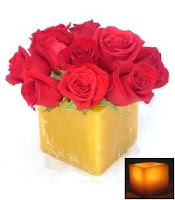 It's a wax vessel candle holder that makes a contemporary home decor piece, but we've filled it with a dozen roses and deliver it with a free votive candle. It's a gift within a gift! Check it out at CactusFlower.com here. Roses are also our Fresh Ten feature of the month: Get a dozen wrapped roses for just $10! Fresh Ten is available for in-store pick up only, and can be found in our cooler. What a hero you will be when you bring home a dozen Cactus Flower roses for no reason at all. Click here to find a store location near you. Go to CactusFlower.com to find all the rose specials for this month. Remember, these prices won't be back for another year! Follow Us on Twitter for "Tweet" Deals!